In the wake of last summer's devastating Western wildfires, the Forest Service is trying to figure out how to restore the unhealthy, doghair, fire-prone forests created by a century of fire suppression and indiscriminate logging. A look at the Intermountain West's trees notes how the different species adapt to and even profit from periodic fires. 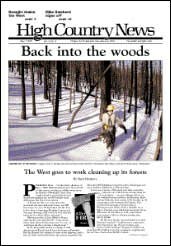 In an interview, former Forest Service Chief Mike Dombeck talks about the changes the agency saw during his tenure, and his hopes for the continuing restoration of the forests. Naming Larry Craig's dog; Alaskan dog-owners beware; Anchorage guy shoots ravens; tumbleweeds spread nuclear contamination; cooking chicken in Yellowstone's hot pots; condor lays eggs; mailing May in 1914. Feedback from readers' surveys; Jon Margolis apologizes for booboo; the many lives of Mark Matthews. The Yakama, Nez Perce, Umatilla and Warm Springs tribes have agreed to a new system, under which their annual take of salmon will be based on a sliding scale that adjusts to wild salmon returns. Can Mr. Nice Guy lead the Forest Service? Newly appointed Forest Service Chief Dale Bosworth is generally liked and respected by agency colleagues, timber advocates and environmentalists, although some greens worry that he may not stand firm in the face of pressure from the Bush administration. Neal McCaleb to head BIA; Bush won't challenge Yellowstone's ban on snowmobiles; Jet Skis may be banned from 21 national parks; Utah joins legal challenge to roadless plan; Telluride condemns land to save it from development. Tucson's innovative Sonoran Desert Conservation Plan will protect hundreds of thousands of acres of virgin desert while still allowing newcomers to build on less environmentally sensitive land. A look at the weather throughout the West shows lower-than-usual snowpacks and a lot of drought, making life hard for farmers and fish, and leading to fears of another fierce wildfire season. Controversy is raging over the practice of poisoning water -- such as New Mexico's Canones Creek -- in order to kill non-native fish and restore natives such as cutthroat trout. Pitkin County, Colo., now has a new "bear ordinance," which requires that every trash can be "wildlife-proof" to discourage scavenging bears and other wildlife. Water from agriculture to flush what?